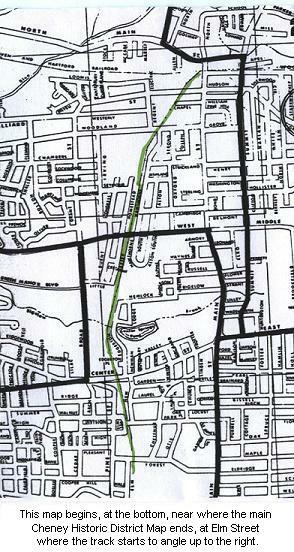 For information on a site, click on the item in this list, or on the annotated area of the map. Move your cursor over a building to see its purpose and construction date in a pop-up label. 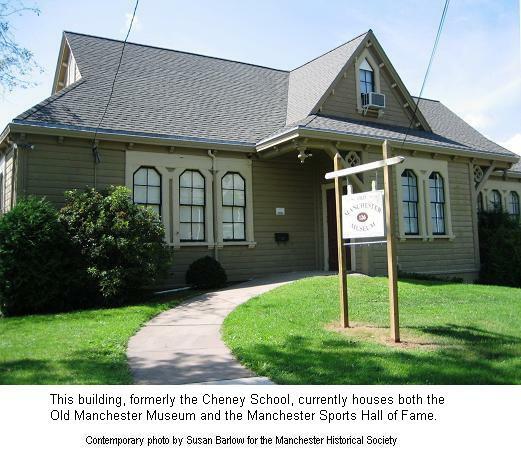 For information on the establishment and ongoing activities of the Cheney Brothers National Historic Landmark District, please click: additional articles. Click on a beige column-heading on the TOP row of the table to sort its contents, toggling between ascending and descending order. To view a larger version of this image, please click here. Click on the contemporary view of the site at the beginning of each segment in order to see a larger image of it. Click on this icon to go to Google Maps (leaving the Society's website), where you can access contemporary images, webcams, and other views of the Historic District. Within Google Maps, click on this icon in the "enlarge / decrease" slide, and drag it to any building to see Google Maps images. 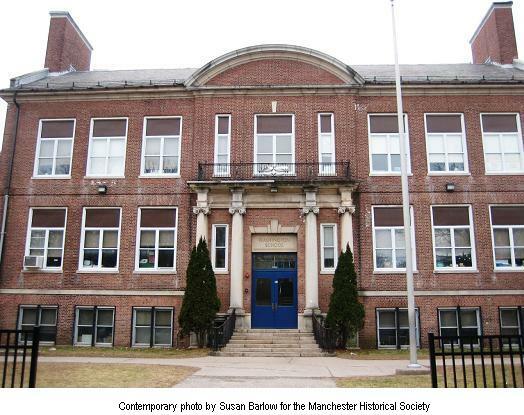 (94 Cedar Street) This elementary school opened on April 12, 1915, and it was a great relief to the school system, after coping with the fire that destroyed the entire Ninth District School (the site of today's Bennet Academy) in October, 1913. Additional information about the school fire can be found at the Elisabeth Bennet:Fire page on this website. Fortunately, no one was hurt in that fire, but the aftermath required double sessions and many temporary arangements. 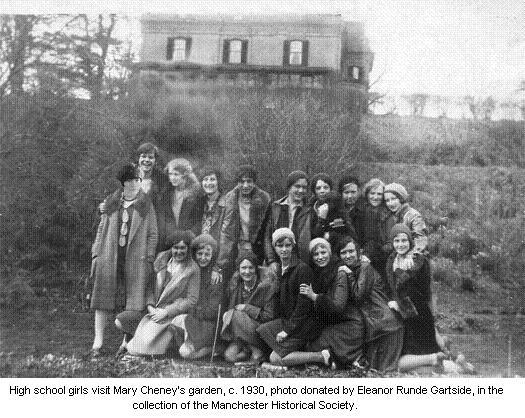 The Washington School cost $62,235.56 to build, and served the children of many Cheney silk mill workers. 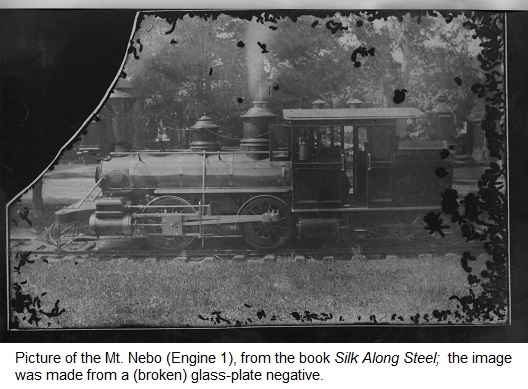 An article on its construction and early history can be found in the "Reprints" section of this website by clicking here. (27 Pleasant Street) The Cheney Brothers built the Pleasant Street bathhouse in 1913, to replace one on Cooper Hill Street that had opened in 1900 but which was now in the way of the new Dye House which was scheduled to be built in 1914. 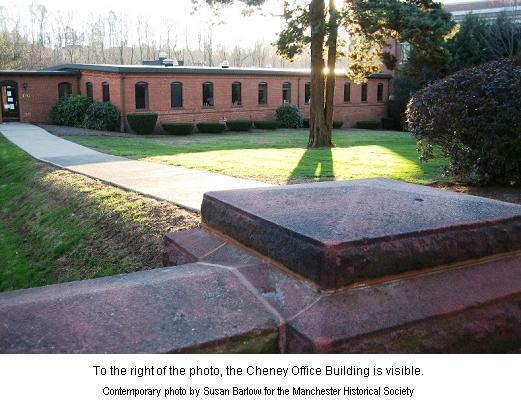 The Cheneys also provided bathing facilities in the "Old Mill" on Hartford Road and at other locations for their employees. The public bath house was open on weekdays at noontime and most evenings; it was also open on both Saturday and Sunday. Baths and soap were free, and towels could be rented or bought at a price lower than the going rate. 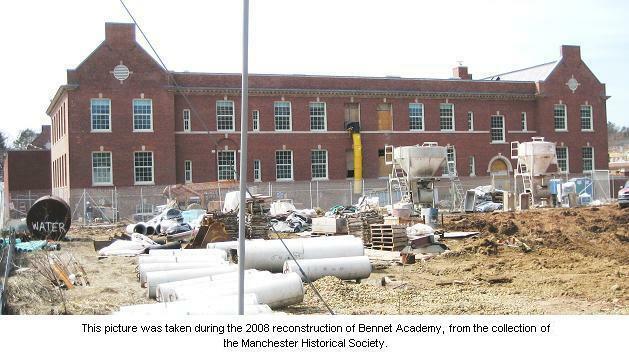 Baths were also available at the Ninth District School; and at the "Rec" Centers � east side at Educational Square (now Bennet Academy), and west side near Washington School on Cedar Street. Even people with running water at home frequented the baths, because they appreciated the free hot water ... especially in summer, when homeowners didn't have a fire going. 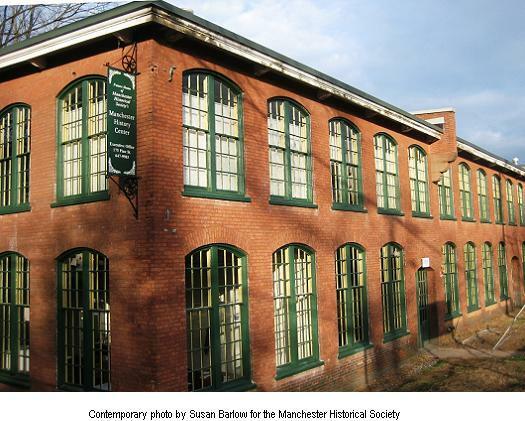 (150 Pine Street) The Ribbon Mill was built in two phases in 1907-1909. A turbine engine was installed in the Engine Room to provide power to the Ribbon Mill. 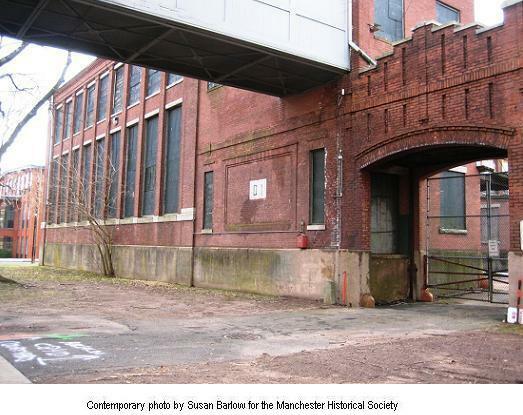 It was the first turbine engine in Manchester. The building has 100,000 square feet. 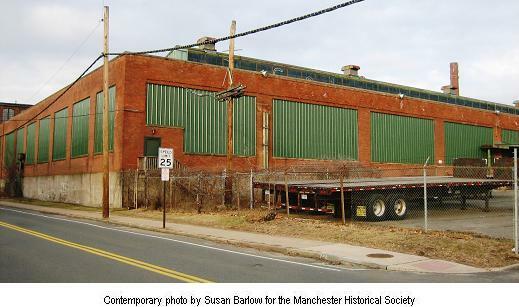 Beginning in 1936, Manchester Modes, a local firm that made ladies' fashions, rented and later bought this mill. 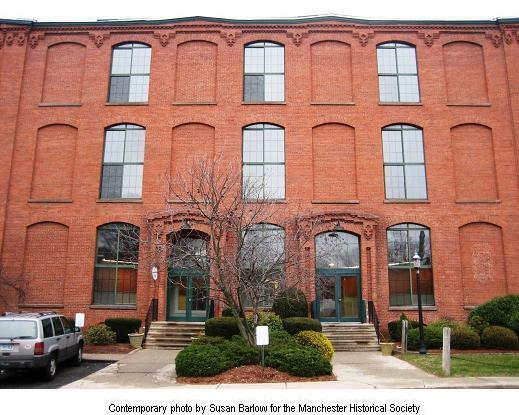 The Ellis family owned Manchester Modes as well as textile operations in New Britain. Today it serves as apartments. 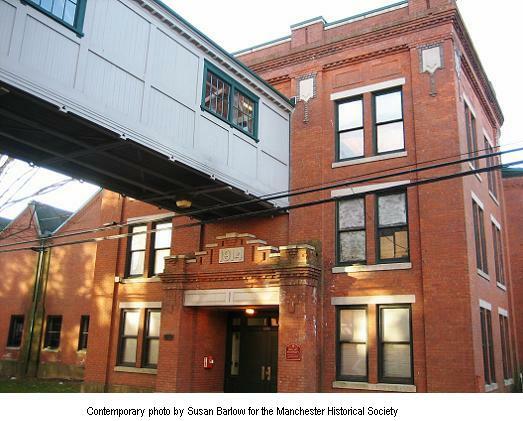 (182 Pine Street) The Velvet Weave Shed was built in 1914 and connects via an overhead walkway to the Velvet Mill across the street. Today the Velvet Weave Shed serves as a parking area for cars of the tenants in the apartments. 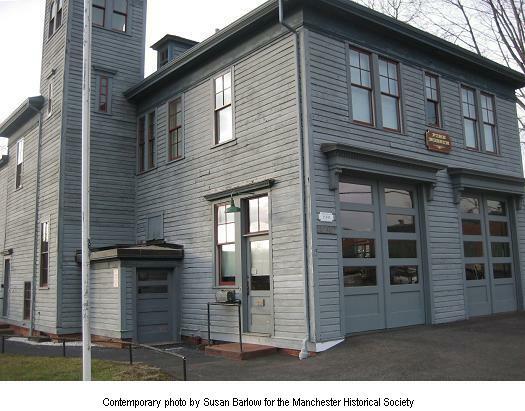 (190 Pine Street) This "new" Dye House was built in 1914, and the dyeing operation, formerly located in a building south of Hartford Road, was moved here. The Dye House wasn't part of the project to convert mills to apartments in the 1980s, but in 2009 a construction company undertook the work of making this into residential apartments. 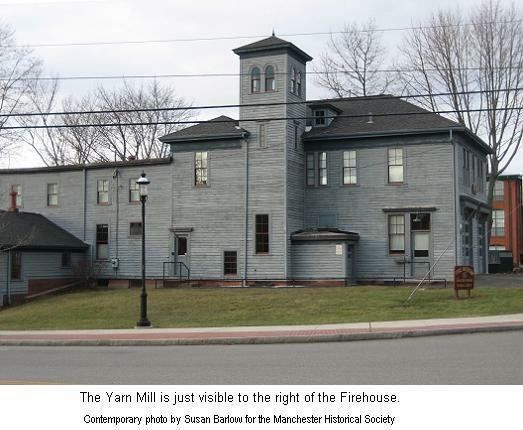 (210 Pine Street) The Yarn Mill was built in 1911. 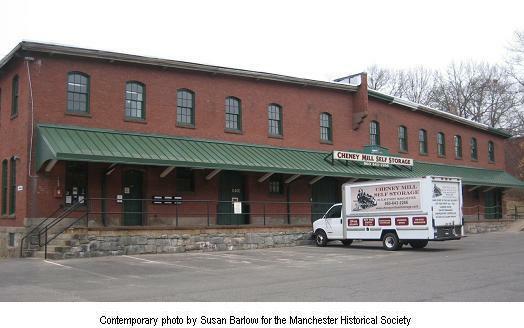 By that time, Cheney Brothers had closed their mills in Hartford, CT, (1909) and work was brought to Manchester. This was a boon to Manchester, as it provided even more jobs. 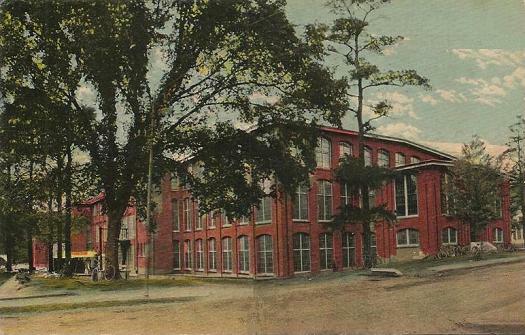 After Cheney Brothers closed, the Yarn Mill was used for many other enterprises, including King's Department Store (a large discount store), and small businesses such as craftsmen, furniture repairers, etc. Today this mill serves as apartments. (218 Hartford Road) Peter Rogers founded the Rogers Paper Manufacturing Company in 1832, and it grew, expanding to include mills on Hartford Road, Charter Oak Street, and eventually on Mill Street in the North End. The mills made press-board and other specialties and employed many workers. This building on the corner of Prospect Street and Hartford Road is now in use for office space. In the 1950s, it housed a Honda motorcycle business. 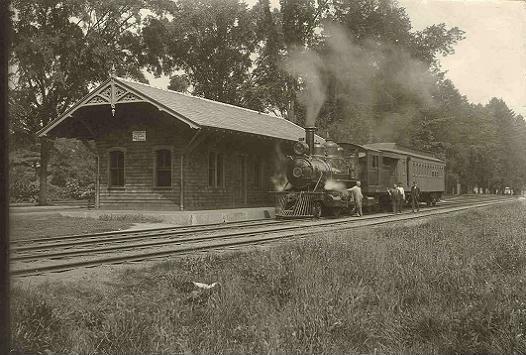 (110 Hartford Road) The Silk Vaults were built in 1919 along the Cheney Railroad. There had been an attempted silk heist in 1919, and William Madden, the security supervisor at Cheney Brothers, was murdered. It was determined that a gang of silk thieves from New Jersey had perpetrated the plot. Today, the Silk Vaults have become a self-storage facility. History Center / Machine Shop. 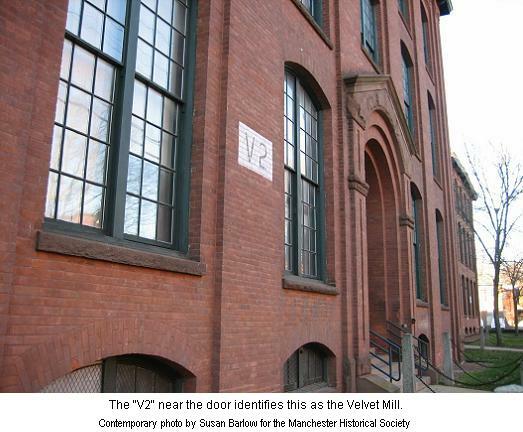 (185 Pine Street) The Velvet Mill, with its grassy courtyards, was built in 1901, and has entrances on both Pine and Elm Streets. 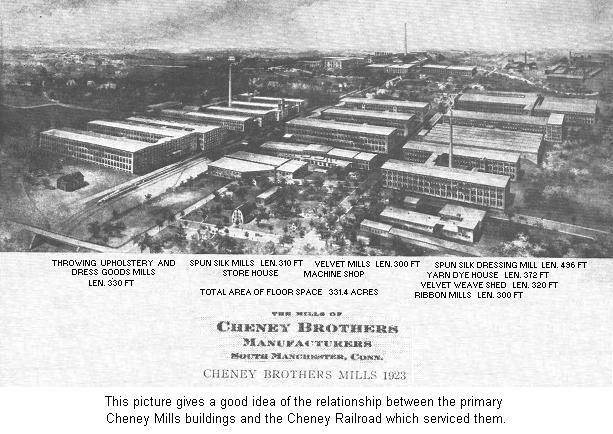 The Cheney recruitment brochures refer to park-like grounds, and certainly compared to Lawrence and Lowell, Massachusetts, mills, this work area would have been far more pleasant. 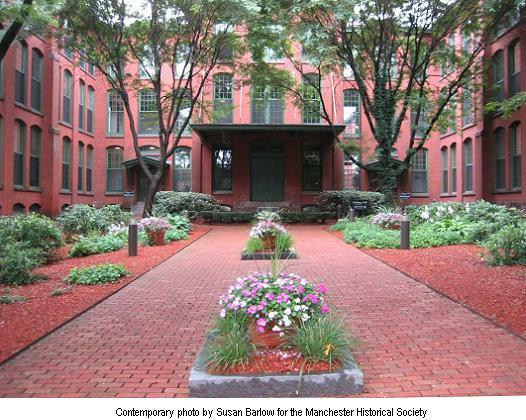 The stone used in this building came from the defunct Union Mills in the North End that Cheney Brothers bought. The velvet operation continued to prosper even after the silk mills' decline. This building today serves as apartments. (15 Hall Court) The Finishing & Printing plant was built in 1946, but has not enjoyed a renaissance as have many of the other former Cheney mill buildings in the District. It has been proposed as the site of a new library for the town, but that hasn't happened. (192 Hartford Road) This handsome colonial-revival style house, built about 1888, was the home of Richard Mommers, a designer and manufacturer of velvet-weaving looms. Cheney Brothers purchased looms from his firm in Germany in 1880, and stipulated that he accompany them to Manchester to supervise the installation. When this task was complete, Cheneys offered him the position of Superintendent of the Manufacture of Velvet, a position he held until his death in 1926 at the age of 80. The building has been remodeled and added on to several times in a process of adaptive reuse, which preserves older buildings while meeting current needs. (176 Hartford Road) This huge concrete building, set well back from Hartford Road, formerly housed the Cheney dyeing and finishing mill, an operation that moved to a building on the north side of Hartford Road as the silk business continued to expand. (91 Elm Street) The Weaving Mill was built in 1886-1887, close by to the Cheney Railroad. A November 19, 1886 Hartford Courant article says, "The silk business was never more flourishing than now, and the mills are run to their full capacity." The weaving mill now serves as apartments. 19. Spinning Mill or "Clock Tower Mill"
(63 Elm Street) This 1872 mill complex is huge, facing Elm Street and extending a long way up Forest Street. Its famous clock tower is at the southwest corner of the mill and it has green lawn and trees around it. In 1935, when this mill was empty due to the Depression and other economic factors, Cheney Brothers developed plans to raze it because of the $7,000 annual tax on just this one building. Fortunately, the Town Selectmen responded with a plan to reduce the taxes. In 1938, Pioneer Parachute got its start in this mill. Today it serves as apartments. 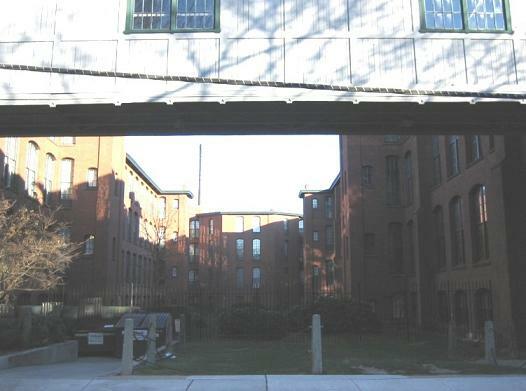 (160 Hartford Road) The brick building on the right formerly held the folding and inspection rooms, where cloth was folded and packaged for shipping. The Cheney Railroad ran along the west (right) side of this building, and there was a loading dock for shipments to be picked up. Today, this building is part of the Fuss & O'Neill office complex, the main office building of which is to the left. (146 Hartford Road) The Cheney Office Building, constructed in 1910, replaced previous office space. New employees would come to this building to complete paperwork before starting their jobs. A long sidewalk, not visible on the map, curves down the hill from the mansions on the Great Lawn to the mills and the Office Building. Unlike mill operations in some other New England towns, the mills and their owners were in close proximity. 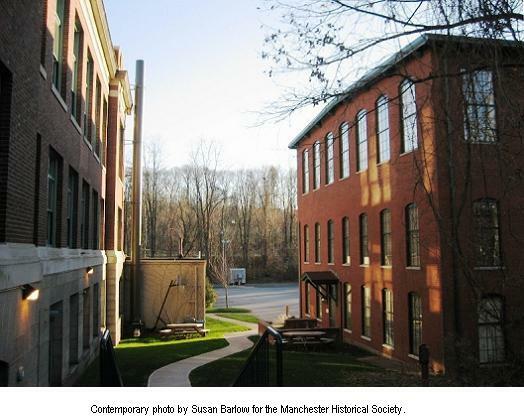 After the demise of Cheney Brothers silk operations, this building housed at different times the electric company; Manchester Community College; and today, the engineering firm of Fuss & O'Neill, which maintains a gallery of vintage Cheney mill photos on the first floor of the building. 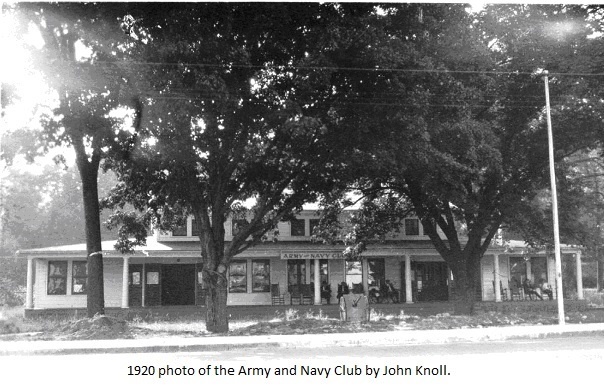 Fuss & O'Neill has invited the Historical Society to visit their building when we lead history walks in the District. 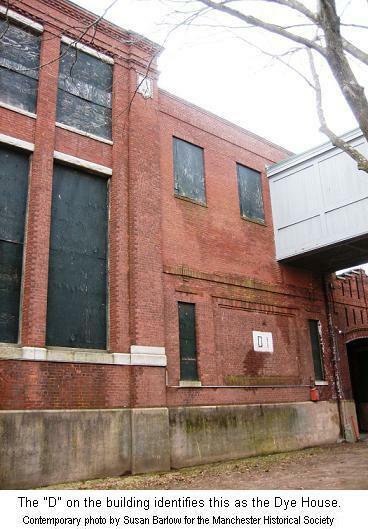 (130 Hartford Road) This 1890 brick building was called the Old Mill, and served as a training facility for Cheney workers. Today, it has medical offices. 79 Hartford Road The broad sweep of the Great Lawn looks much the same as during the boom years of the Cheney silk business (about 1859 to 1929). 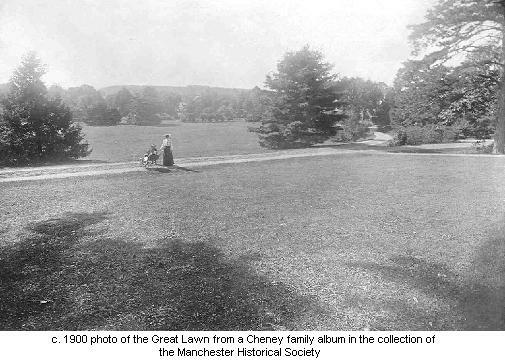 The Cheney family opened the lawn to the public, who came to pick dandelions for cooked greens; to find worms for use as fish-bait; and in winter to ski, sled, and toboggan. 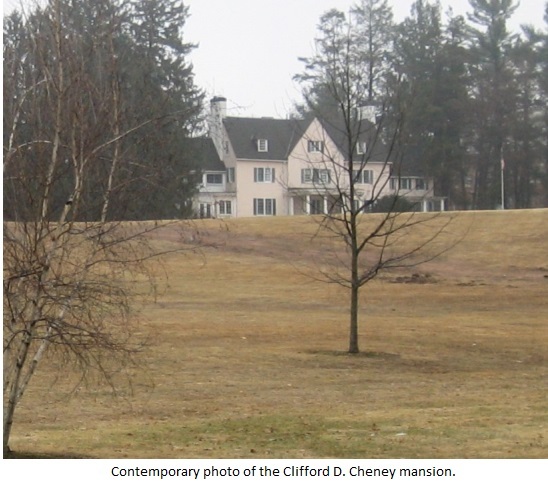 Beginning in 1942, the mansions on the Great Lawn were sold to non-Cheney families; and today none are owned by Cheney descendents. 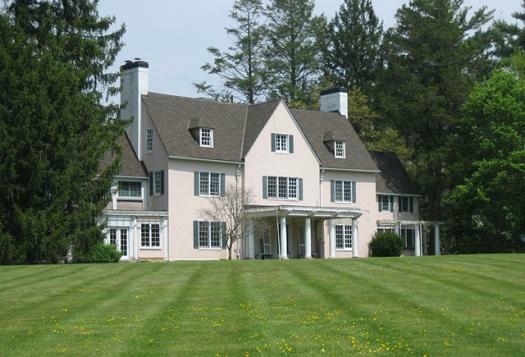 Over the years there have been proposals to build condominiums on the lawn, which the Historical Society has opposed and which the Viscogliosi family prevented by buying the mansion of the owner who proposed the condominiums. 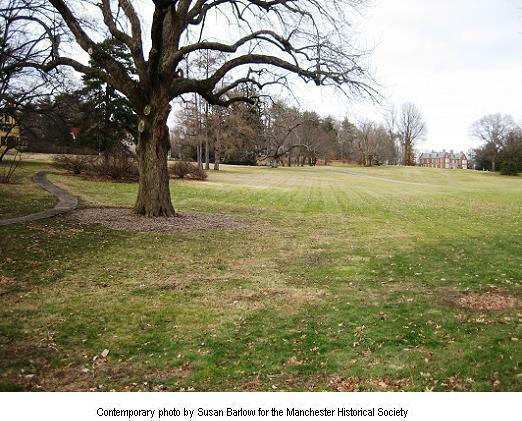 The Town of Manchester purchased nine acres of the lawn (the portion with the largest frontage on Hartford Road) in 2002 for open space to preserve this historic area. The rest of the Great Lawn is owned by the mansion owners. 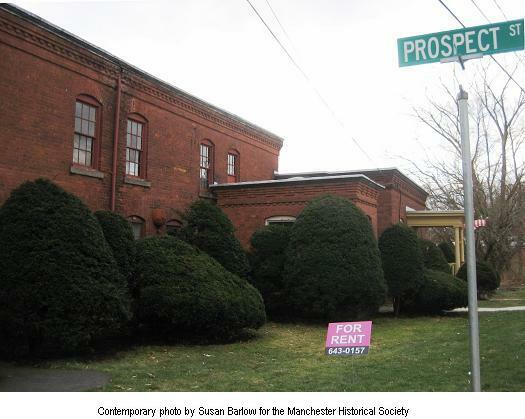 The Historical Society leads walks in this area, but stays on town-owned property unless invited by homeowners to come visit. (48 Hartford Road) This three-story mansard-roofed brick house was designed by Hammatt Billings, who was also the architect of Cheney Hall. 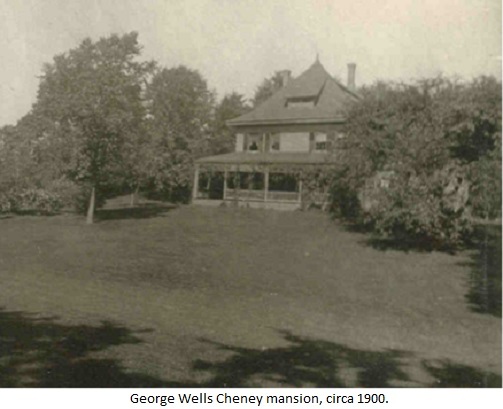 The mansion was built about 1866 for Frank and Susan Cheney, parents of philanthropist Mary Cheney (1855-1934) who lived there until her death. 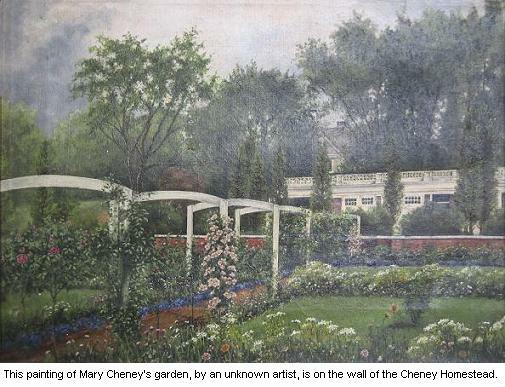 Mary Cheney kept a large garden as if it were a public park, open to all who wished to visit. Miss Mary's garden was designed by Charles Adams Platt, noted artist and architect, and was maintained by a staff of gardeners. (20 Hartford Road) The Frank Cheney, Jr. Mansion is now used as office space, including the Greater Manchester Chamber of Commerce. Built in 1901 with a third floor added in 1921, it is one of five mansions in the Great Lawn area that were designed or remodeled by Charles Adams Platt. Both this and the house next door (the Frank and Susan Cheney Mansion) are owned by the South United Methodist Church. 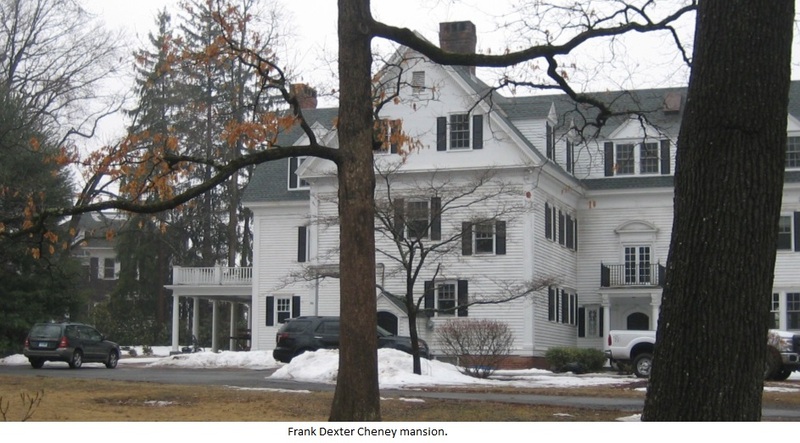 For additional information on the Mansion and on Frank Cheney, Jr. himself, please click Frank Cheney, Jr. Mansion Reprint. 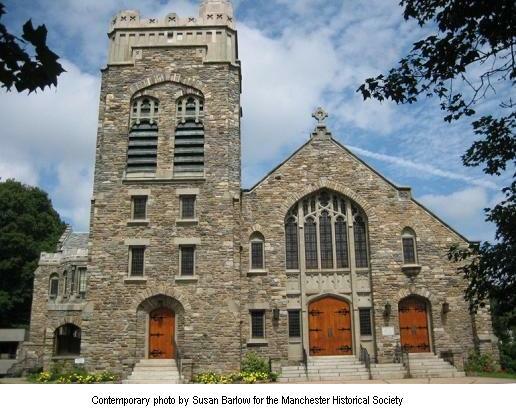 (1226 Main Street) This English Country style stone church was dedicated in 1924. A history of this church can be found at the church's website. 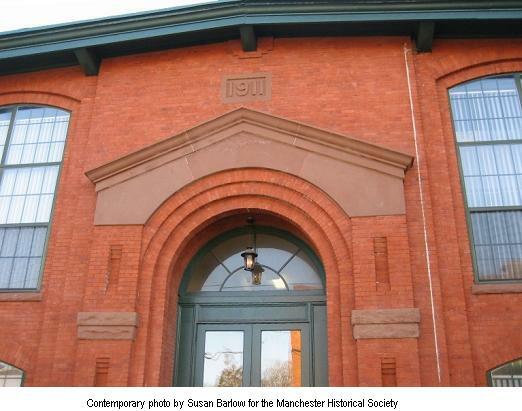 (1151 Main Street) The former Educational Square, built in 1915, is named for Principal Elisabeth M. Bennet. 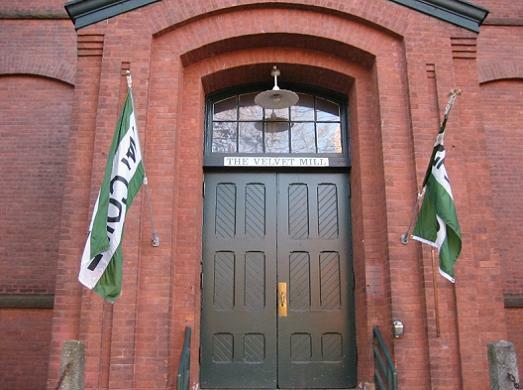 At one time the complex included a technical school, and at another time it was a junior high school. 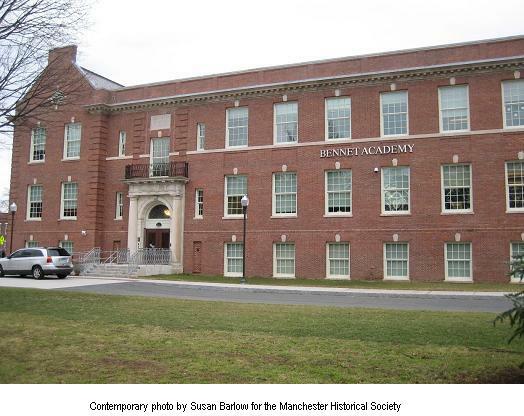 It has recently been renovated as a sixth-grade academy, but there were proposals to abandon or demolish the school complex, rather than preserve it for the students of Manchester. 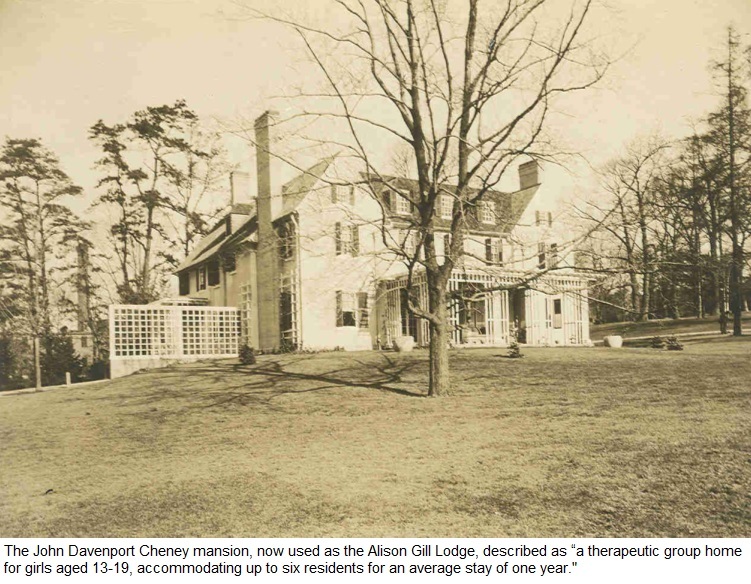 (151 Hartford Road) This mansion is now used as the Alison Gill Lodge, "a therapeutic group home for girls aged 13-19, accommodating up to six residents for an average stay of one year." This mansion was designed by Charles Adams Platt for John Davenport Cheney (1870-1919), known by the family as Dave. He was one of the 12 children of Frank Woodbridge Cheney and Mary Bushnell Cheney; his twin brother was Howell Cheney. He and his wife, Maizie Russell, had two daughters, Jane and Cynthia. Jane married pediatrician Dr. Benjamin Spock. 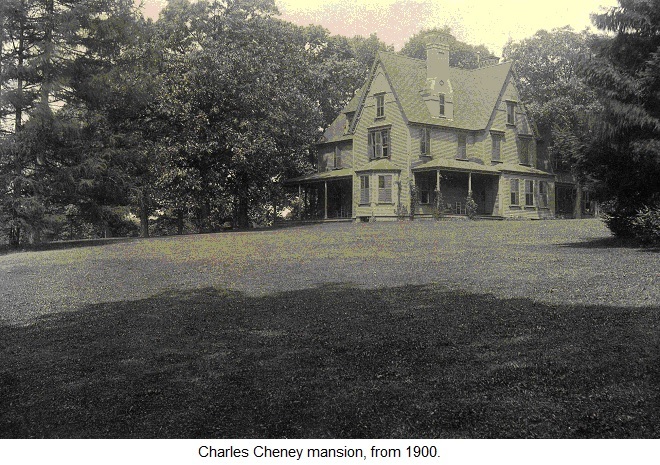 This was the first of the Cheney mansions to be sold outside of the family. It was sold to the Dobkin family about 1942. (139 Hartford Road) Seth Leslie Cheney mansion, 139 Hartford Road, now used as the Mansion Inn Bed & Breakfast. This house started out as a cottage in 1840, with extensive additions and remodeling over the years. Charles Adams Platt designed the 1910 addition. 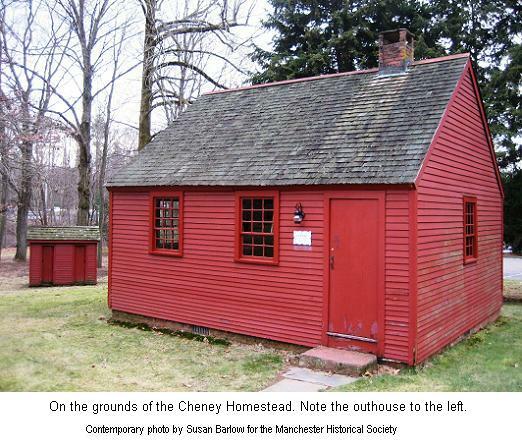 Among the Cheneys who lived here was Lovisa ("Vicy") Rich, a cousin who came at the age of twelve to help Electa Woodbridge Cheney care for her family. In the 1890s Arthur and Emmeline Cheney lived there. It was redesigned and expanded, also by Charles Adams Platt, when it became the home of Seth Leslie Cheney (1874-1942) and his wife, Katherine Bell (1872-1947). Bruce and Marian Hamstra bought it in 1995, spent several years rehabilitating it, and have run it as an inn. 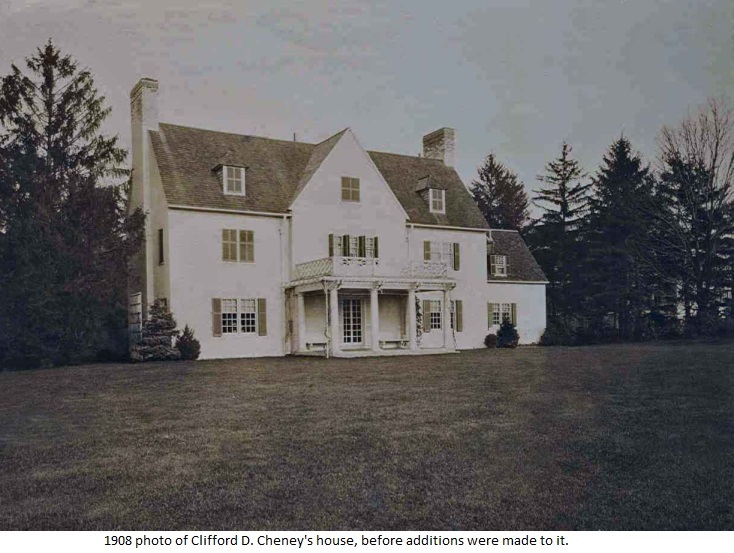 (131 Hartford Road) Charles Cheney (1866-1942) was the eldest son of Frank Woodbridge Cheney and Mary Bushnell Cheney and served as President and Chairman of the Board of Cheney Brothers. 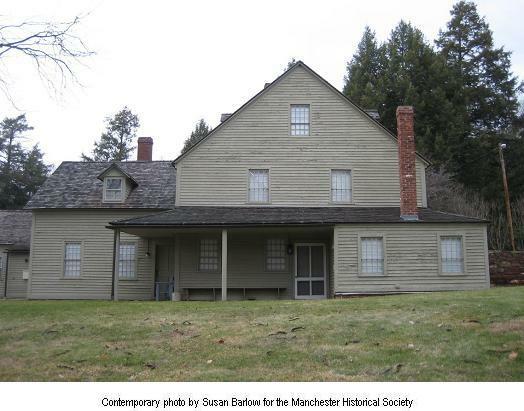 He took over this home which had belonged to his great-uncle, Ward (1813-1876), who was a founder and President of Cheney Brothers. The house was designed by Hammatt Billings in the Gothic style, and extensively remodeled in 1913, as were many of the mansions during the early 20th century. This remodeling, for Charles Cheney, was designed by Hartford architect A. Raymond Ellis, the influential architectural editor of Woman's Home Companion magazine in the 1920s and 1930s. The house was originally clapboard and then was recovered with stucco for a Tudor-style look. Tax records date a home here in 1851. 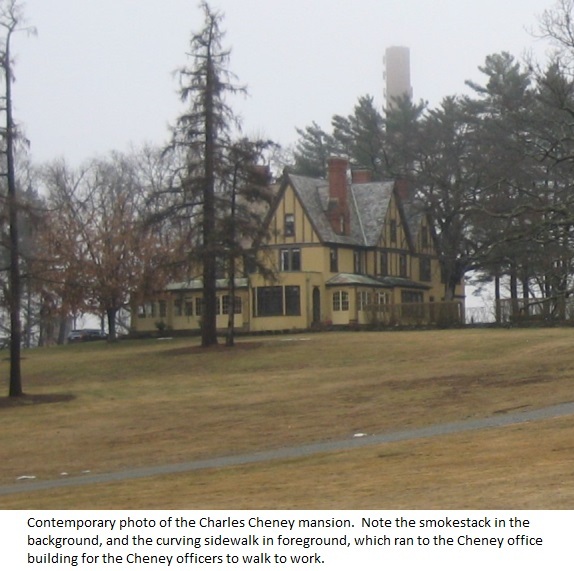 More about this mansion and Charles Cheney can be found on this web site by clicking here. (110 Forest Street) Originally built about 1903 and then doubled in size. Owner Howell Cheney (1870-1947) one of the twelve Frank Woodbridge Cheney children, and the twin of John Davenport Cheney. He married Annie Bunce, and together they had eight children; Anne, Laura, Helen, David, Kimberly, Timothy, Mary Bushnell and Emily. 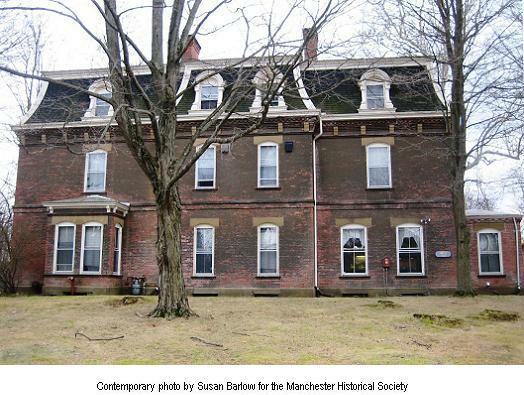 President Taft and Robert Frost were guests at this home. 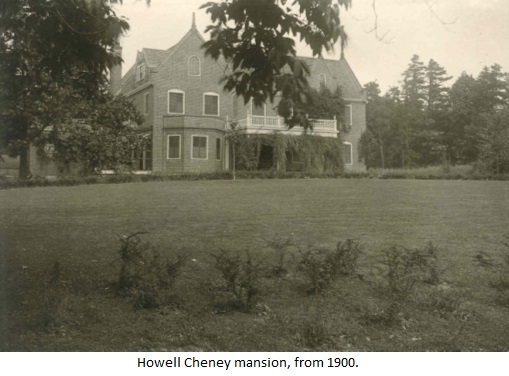 This was the home of Emily Cheney Neville, author of Traveler from a Small Kingdom.�Read more about Howell Cheney in this web site by clicking here. Gerald and Hope Krause bought this house in 1976 and undertook a meticulous and authentic restoration and rehabilitation over the course of 30 years. (99 Hartford Road) The Austin Cheney mansion, also known as "Wedgeway," due to the shape of the property. Austin (1876-1948) was the eighth child of Frank Woodbridge Cheney and Mary Bushnell Cheney. Austin, together with his brother, Horace, managed the weaving mill. Austin and his wife, New York debutante Ruth Sears Bacon, built their home in 1911, with a 1921 addition on the southwest. It is technically the newest of the mansions, although the massive remodeling of the Philip Cheney mansion in 1928 can be viewed as the "newest." 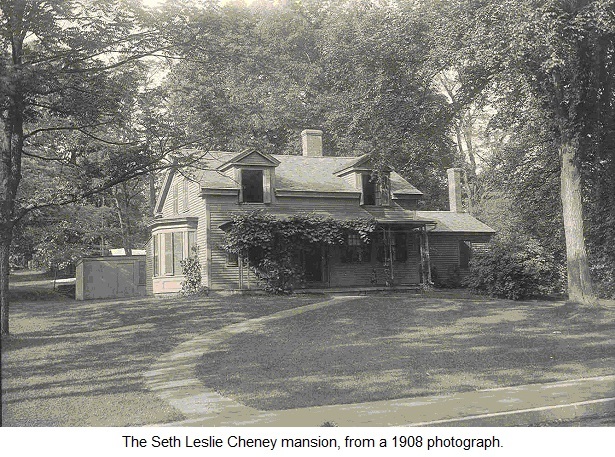 Mrs. Cheney lived in the home until the 1970's and lived to be over 100. When she was four years old, her portrait was painted by John Singer Sargent; it's in the Wadsworth Atheneum. Robert Shanbaum, who owned the house with his wife, Susan Hill Shanbaum, from 2001 to 2016, said, "I've determined from the original plans to our house, which we're fortunate to still have, that it was designed by Mills & Greenleaf, a New York firm of some repute. Later additions were designed by John Cameron Greenleaf, one of the partners in Mills & Greenleaf." The Shanbaums did extensive work to rehabilitate the mansion, which had deteriorated substantially under previous ownership. 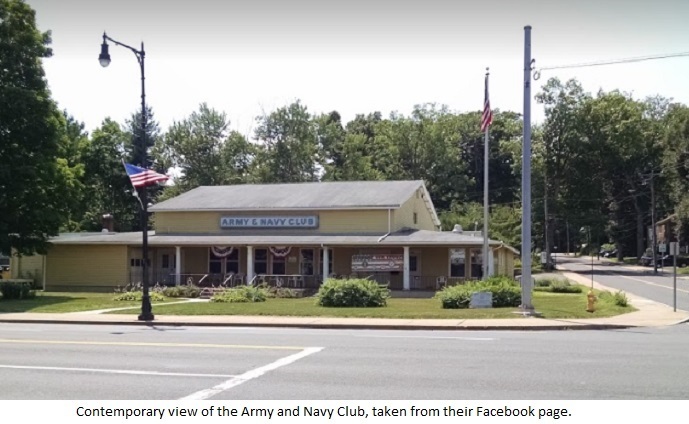 In 2016 it was purchased by Hartford Road Holdings of Oyster Bay, NY, to be used to house students from abroad attending Connecticut schools. (98 Forest Street) Frank Dexter Cheney (1878-1955), known in the family as "FD," was the youngest son of Frank Woodbridge Cheney and Mary Bushnell Cheney. He and his wife, Sarah Otis Amory, had five children: Rosalie, Dexter, Amory, Hope, and Teddy. The white clapboard Colonial Revival style house, built in 1902 and added on to in 1912, is one of the largest extant mansions with 21 rooms and over 7,500 square feet. 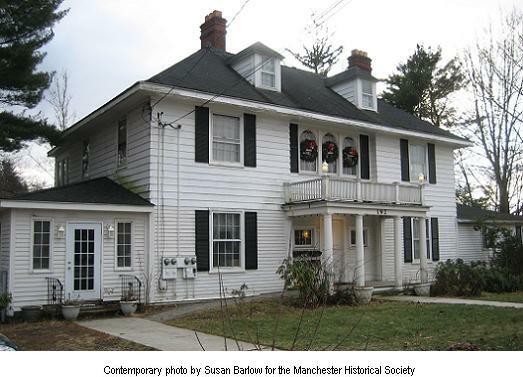 Jon and Laura Reichelt purchased the house in 1997 and have carefully restored and rehabilitated it. The front of the house faces the Great Lawn and Hartford Road, although the address is on Forest Street. 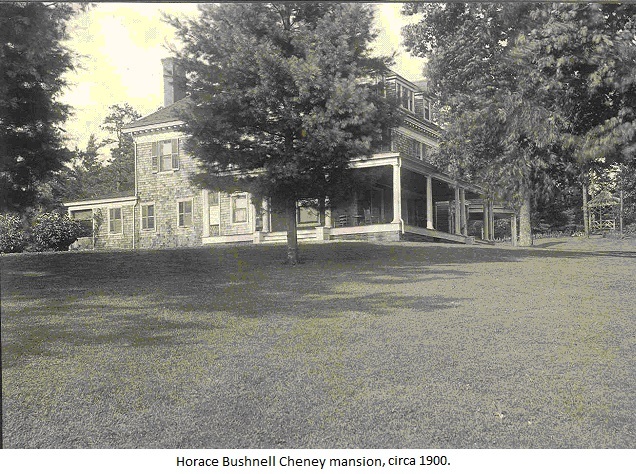 (78 Forest Street) This shingle-style home was built by Horace Bushnell Cheney (1868-1936) the third child of Frank Woodbridge Cheney and Mary Bushnell Cheney. He and his wife, Mary Pierson, had five children: Horace Bushnell Jr., Antoinette (author of Great Oaks, Memoirs of the Cheney Family), Stephen, Roger, and Hannah Latimer. He wrote The Story of Silk, and was working on a history of the Cheney family at the time he was killed in an automobile accident in Santa Fe. The Ferguson family lived in the house for 51 years. (50 Forest Street) This brick, Jacobean style home was location of the home of Knight Dexter (known as KD) Cheney (1837-1907), brother of Frank Woodbridge Cheney. KD was President of Cheney Brothers from 1894 to 1907. 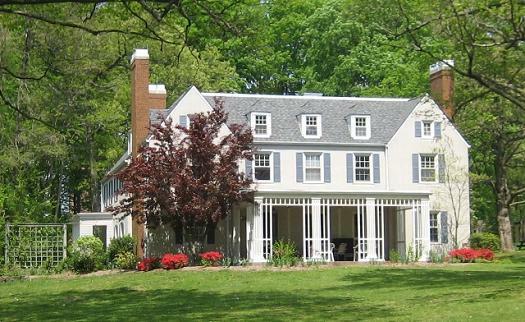 The original clapboard home designed by Stanford White was inherited by KD's ninth child, Philip. A massive redesign/reconstruction in 1928 took down the majority of the KD home and was designed by Charles Adams Platt, around the living room of the KD home. This is the largest of the remaining mansions, having about 20,000 square feet, depending on what is counted. Anthony Viscogliosi bought this house about 2004. He and his wife, Paula, have completed extensive and historically authentic renovations of the house and grounds, and have opened the house for fundraising events for the community. Jared Edwards, preservation architect, worked with the Viscogliosi family on the multi-year project. 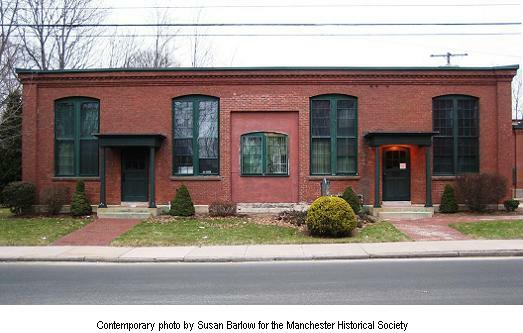 (30 Forest Street) The buildings at 30 Forest Street, had originally been a horse barn, carriage houses, and caretaker cottage. 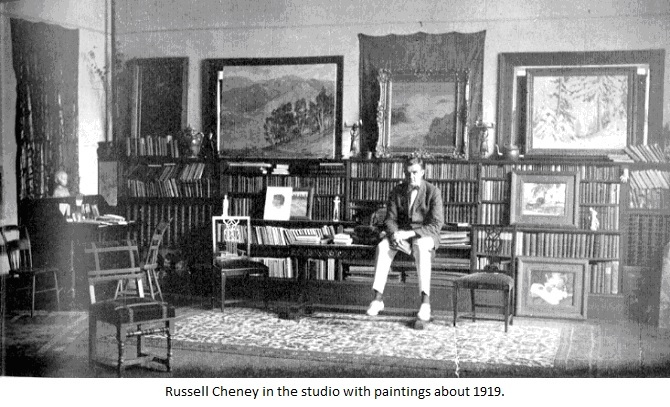 Russell Cheney (1881-1945), youngest child of Knight Dexter Cheney, remodeled part of the horse barn to use as his artist's studio before moving permanently to Maine. Read more about Russell in this web site by clicking here. Subsequent residents were the Learned family and the Maxwell-Campbell family. Jon and Laura Reichelt bought the property in 2006. (40 Forest Street) This stucco home was designed by Charles Adams Platt and built in 1904 and subsequently expanded. Clifford married his cousin, Alice Elizabeth (Cass) Cheney. They knew they were not going to have children, so they built a smaller home, about 5,000 square feet. 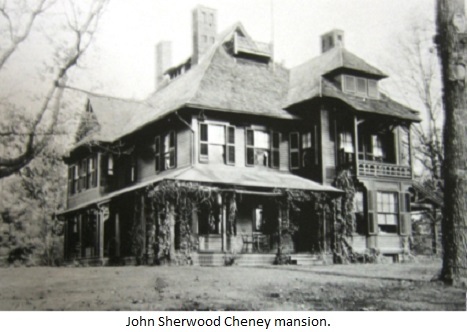 Her father, John Sherwood Cheney, lived in the clapboard mansion across Forest Street. Her brother, Sherwood A. Cheney, was a general, military attach� to China, and was married to Louise Delano, cousin of Theodore and Franklin Roosevelt. (21 Hartford Road) This is the second oldest of the Cheney homes, after the Cheney homestead, and is modest compared to the renovated mansions. 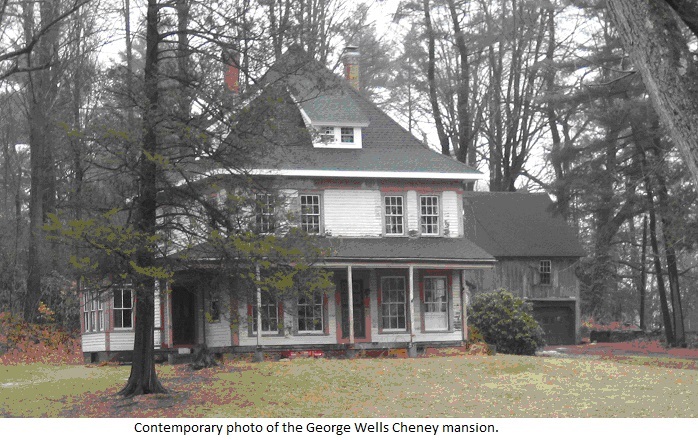 George Wells (1799-1841) was a brother of silk mill founder Charles Cheney, father of KD and FW Cheney, and himself of the founding generation of brothers who started Cheney Brothers. He also served as Manchester Town Clerk and a Justice of the Peace from 1828 until his death. The house was moved up the hill away from Hartford Road, and has been owned by its next-door neighbor, the South United Methodist Church, since 2003. (1090 Main Street) The building was constructed after World War I and has been expanded over the years. 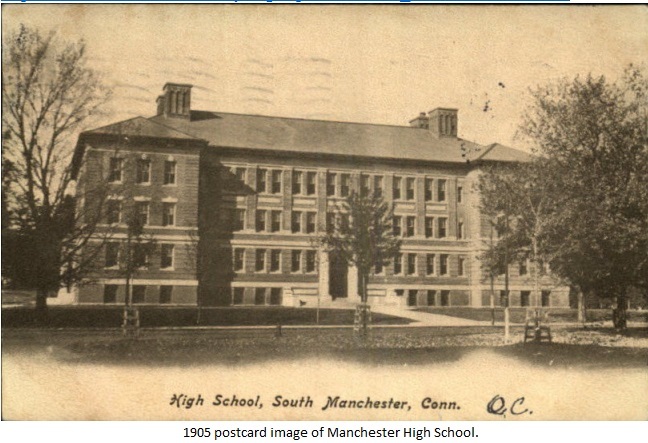 (1146 Main Street) Old Manchester High School, built by the Cheneys in 1905. Its last graduating class was in 1956. Today the building is still standing, being used for senior housing. 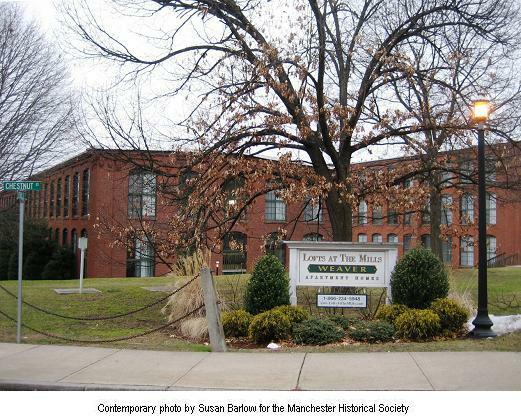 To read more about th3 building in this web site, please click Manchester High School. 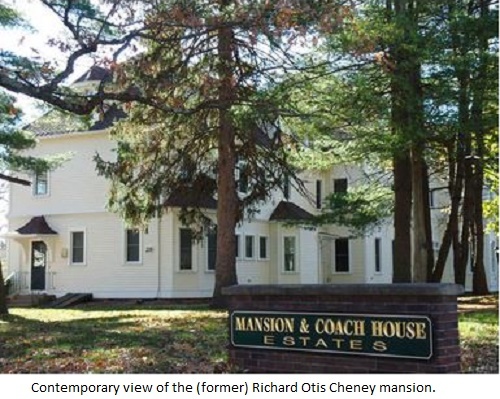 (20 Otis Street) "Oak Hill," the Richard Otis Cheney mansion, an 8,971-square-foot mansion built in 1910 for R.O. Cheney (1874-1931). It was converted into apartments in the 1940s. Additional information on this mansion can be found in this web site by clicking here. 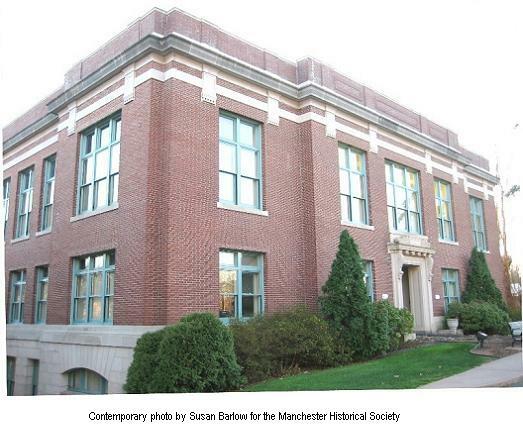 While not officially part of the National Historic Landmark District, it is being included here because on Manchester Historical Society "Mansion Walks" tours of the District, this is included because of its close proximity to the District. It's also why there's no building outline for it on the map. 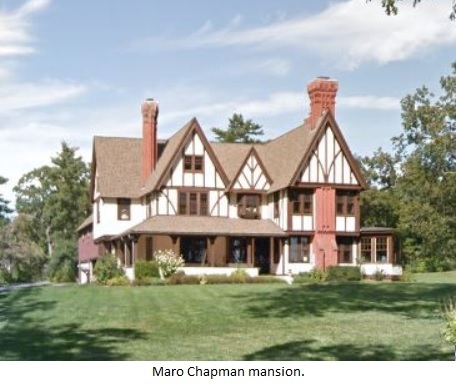 (75 Forest Street) The Maro Chapman mansion, a half-timbered Tudor-style mansion, was formerly owned by Maro Chapman (1839-1907), a principal in the Plimpton Envelope Company, of Hartford, securing contracts for envelopes needed by the Federal government. 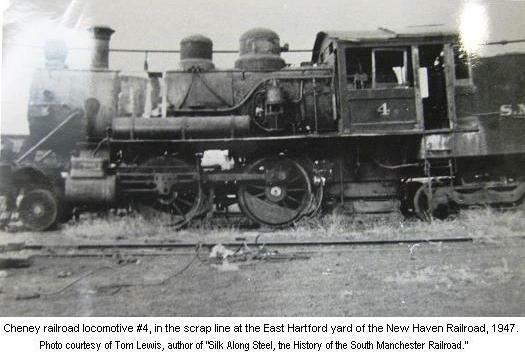 Chapman also founded the Manchester and Rockville tramway, which he "built with his own resources and turned over to the stockholders in complete running order." He continued as president of the road until 1905, when he disposed of his holdings to the Shaw syndicate of Boston, at a large profit on the original investment. You can read more about Maro Chapman in this web site, by clicking here. 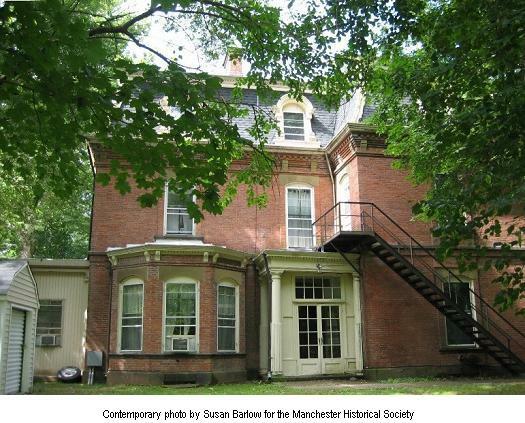 While not officially part of the National Historic Landmark District, it is being included here because on Manchester Historical Society "Mansion Walks" tours of the District, this is included because of its close proximity to the District. It's also why there's no building outline for it on the map. 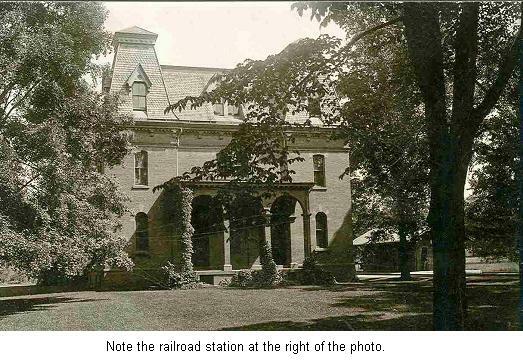 (43 Forest Street) The John Sherwood Cheney mansion, was built in 1869 in the "Carpenter Gothic" style. It's a 42x47-foot-square (4308 s.f. with ells), two-and-a-half-story frame structure with steep hipped roof with one-story shed-roofed porch with balusters. The interior includes five fireplaces and carved wood doors and window casings. 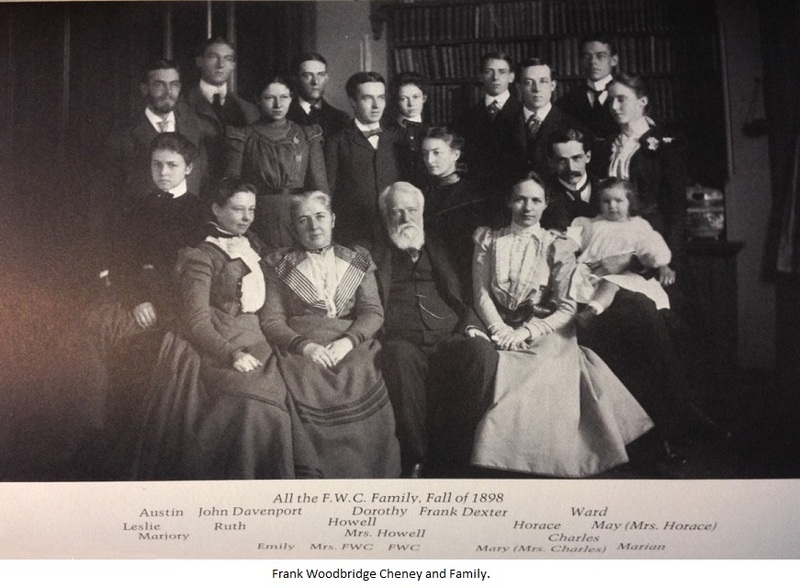 John Sherwood Cheney (1827-1910) was the son of George Wells Cheney, of the founding generation of the silk mills. He and his wife, Ellen Coates, were married in 1861 in Creswick, Australia. They had seven children, including Sherwood Alfred Cheney (1873-1949), West Point Class of 1897 and a U.S. Army Brigadier General. Dr. Joseph Danyliw purchased the house in 1964 and has carefully maintained it. 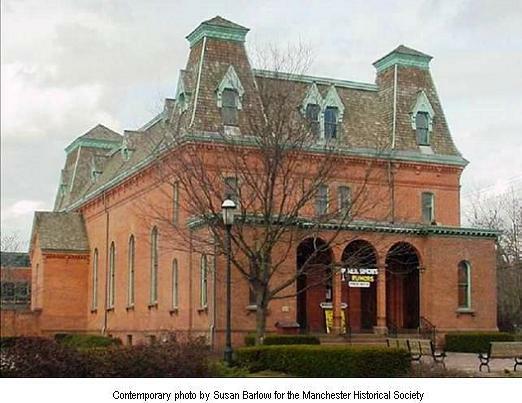 While not officially part of the National Historic Landmark District, it is being included here because it's mentioned on Manchester Historical Society "Mansion Walk" tours of the District, and is in close proximity to the District. It's also why there's no building outline for it on the map. 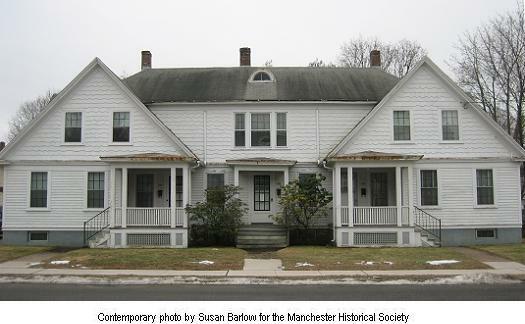 (87 Hartford Road) While the mansion no longer exists, its location is often pointed out during walks of the National Historic Landmark District given during the Manchester Historical Society "Mansion Walks" tours of the District. The Google map only shows its street location; the map shows its approximate location prior to its demolition. It's also why there's no building outline for it on the map. Some information on the mansion can be found in the "Flyers" section of this web site, by clicking here. 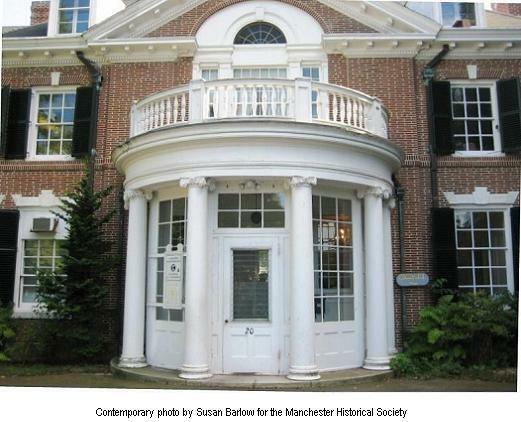 (80 Hartford Road) While the mansion no longer exists, its location is often pointed out during walks of the National Historic Landmark District given during the Manchester Historical Society "Mansion Walks" tours of the District. The Google map only shows its street location; the map shows its approximate location prior to its demolition. It's also shy there's no building outline for it on the map. Some information on the mansion can be found in the "Flyers" section of this web site, by clicking here. 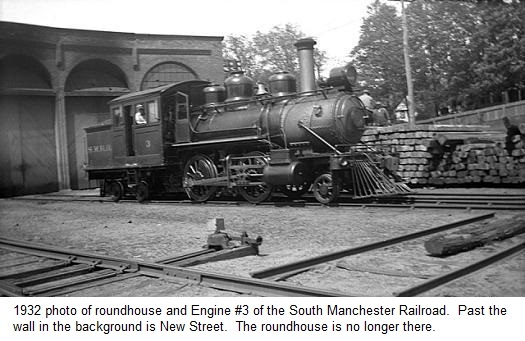 The South Manchester Railroad (SMRR) was built by Cheney brothers in 1869. 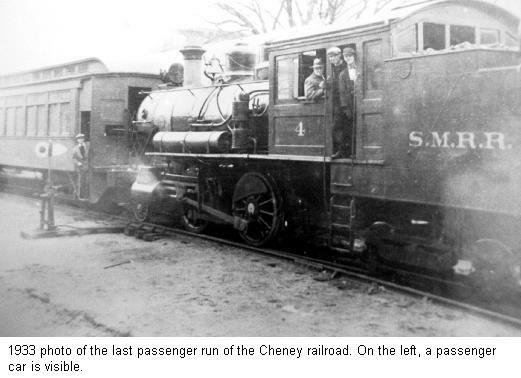 According to "Silk Along Steel," Thomas Lewis's history of the railroad, this was the one of the shortest passenger lines, providing service to Cheney workers and families similar to that provided by trolleys of the period. The railroad's passenger service ended in 1933, but freight still rolled along the rails up into the 1980s. > While the railroad track itself no longer exists, viewers can see a YouTube video of a walk along the trackway, made by the Society in 2008, by clicking the "Video" icon above. > If you wish to take an MLCT- or self-guided tour of the trackway, you can access a map of it by clicking here. 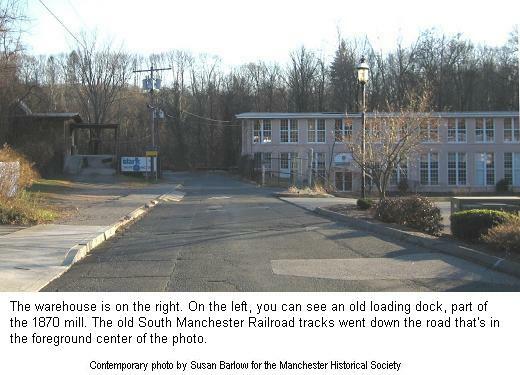 • From Track to Trail, a reprint of an article by Peter Marteka, of a Manchester Land Trust hike along a portion of the SMRR rail line. 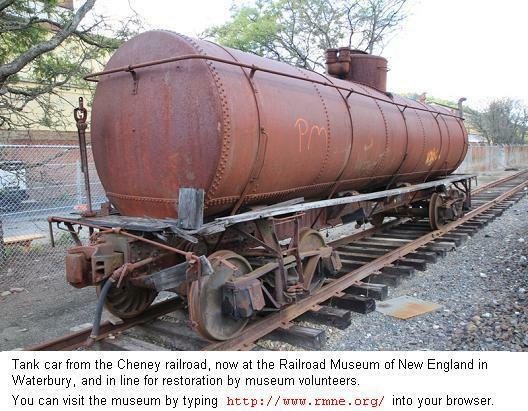 > And, to access the Railroad Museum at New England, where the tank car above is awaiting restoration, please click: www.rmne.org/. 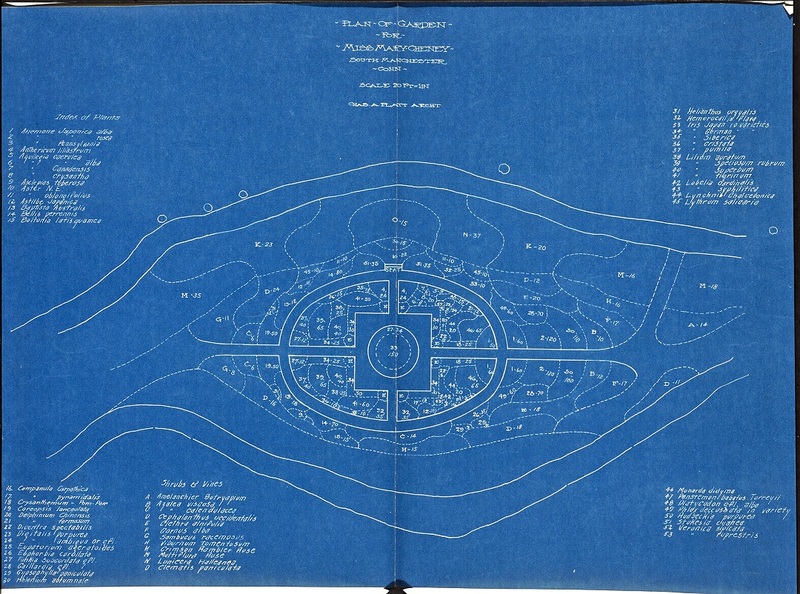 The large W's on the map indicate some of the housing that Cheneys built for their workers. 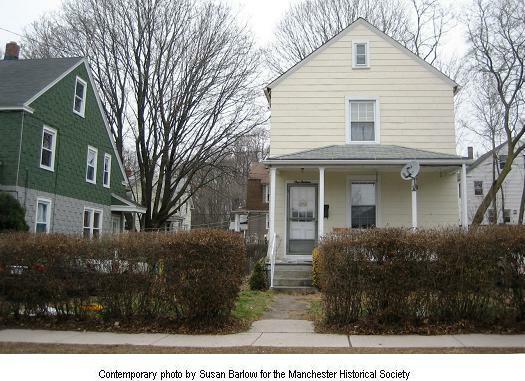 Houses were built from the 1860s (Eldridge Street) through the early part of the twentieth century (Fairfield Road). A mill foreman or manager might have a single-family house, whereas mill hands might live in a two-, three-, or four-family house. Newest immigrants might start out staying at a boarding house, or boarding with a family. As the workers prospered, they might move into a house and later buy the house. 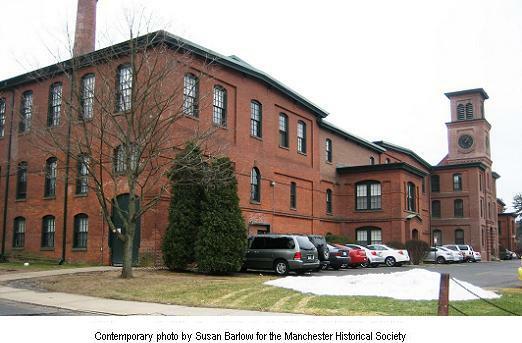 Other mills in Manchester provided worker housing, but the Cheney houses had larger yards and more amenities than those built near Union Mills and Globe Mills. When the Cheney mills fell upon hard times, an auction was held (in 1937) to sell off the worker housing. Many tenants bought the houses that they lived in. For more information on the auction on this website, please click Cheney Housing Auctions. In the 1970s, Cheney worker housing was a factor in attaining the National Landmark Historic District designation, which recognized the large and intact District, including mills, mansions, and worker housing. 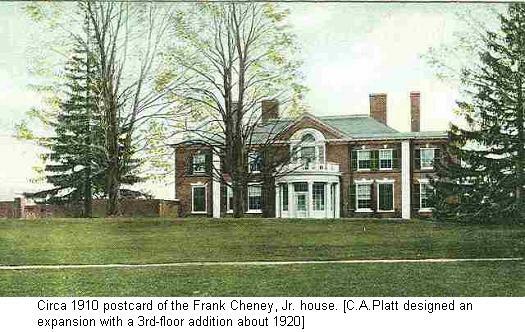 Noted architect and artist Charles Adams Platt (1861-1933) was the grandson of George Wells Cheney (1799-1840), brother of the founders of the silk mills. 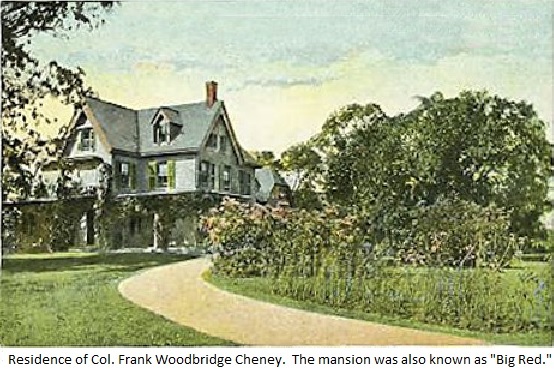 His work in Connecticut includes the Rockville Public Library, and the mansion that became Rockville General Hospital, as well as new construction and renovations of Cheney mansions and gardens along Hartford Road. 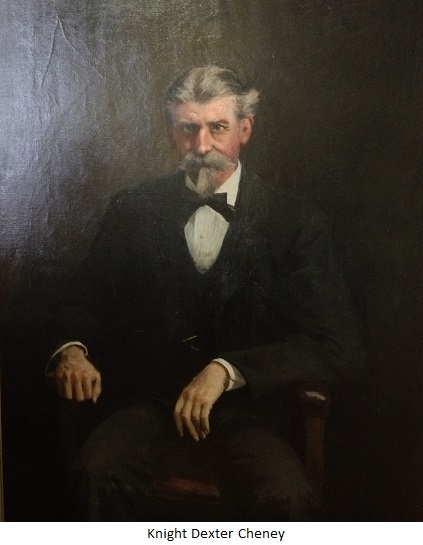 Additional information on Mr. Platt can be found on the Columbia University website, as well as an article in the Reprints section of this website: Center of Historic Architecture link. 151 Hartford Road (the light gray house closest to Cheney Hall) was built in 1905 for John Davenport Cheney, whom the family called Dave. At 4,000 square feet, it is one of the smallest mansions. 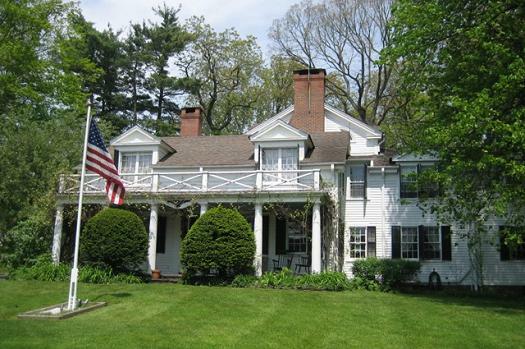 139 Hartford Road � "Mansion Inn" bed and breakfast � Platt designed the 1910 addition. The house started out as a cottage in 1840 and was expanded and remodeled over the years. Among the Cheneys who lived here was Lovisa Rich, a cousin who came at the age of twelve to help Electa Woodbridge Cheney care for her family. 50 Forest Street � the brick Italian-Renaissance-Revival-style Philip Cheney mansion, the extensive renovation of which was designed in the 1920s by Platt. He designed the garden and the interior d�cor, selecting the furniture and wall coverings. Family tradition says that this house, formerly the Knight Dexter (K.D.) Cheney house, didn't suit Philip Cheney's bride, Helen, and that the only part that remains of the previous (1878) structure is the living room. This is one of the largest extant mansions. The 1904 pink stucco Clifford Cheney Mansion, to the right of the Philip Cheney mansion, is also a Charles Adams Platt design. 20 Hartford Road � Frank Cheney, Jr. Mansion, now used as office space. Built in 1901 with a third floor added in 1921, it is one of five mansions along Hartford Road or Forest Street designed or extensively remodeled by Charles Adams Platt. (No longer in existence) Mary Cheney's large garden � kept as if it were a public park, it was designed by Charles Adams Platt, and maintained by a staff of gardeners. Read more about Mary Cheney. Charles Adams Platt's landscape design for Mary Cheney's garden.